Is it bad that every night after dinner I want to go to Yogurtland? There's one way too close to our house that is continually calling my name. Bad Yogurtland. Do you all have these serve yourself yogurt shops in your area? With 10+ frozen yogurt flavors to choose from and a bounty of toppings (from nuts, to crushed candy bars, to mochi, to captain crunch and fresh fruit)? The possibilities are endless! One of my favorites is devils food cake batter frozen yogurt topped with toffee bits, reeses's peanut butter cup chunks and why not throw in some juicy strawberry slices? Also loving strawberry cheesecake and cinnamon graham cracker yogurts topped with graham cracker crumbs, crushed oreos, a little dragon fruit and more fresh strawberries. So good. Especially on a hot summer night. What does delicious frozen yogurt have to do with grilled vegetables? Nothing, really. Except that I wanted to venture out for a yogurt after our grilled steak and veggie dinner last night. But that happens a lot of nights. Instead of succumbing to frozen yogurt and topping temptations, I ate a handful of chocolate chips to get my sweet on (yeah, I did....and no it wasn't the first time). I don't feel too bad eating something sweet after a meal consisting mostly of vegetables. Grilled veggies are another favorite summer food (after frozen yogurt of course). They are easy to prepare and have that tasty browned grilled goodness that only a barbecue can produce. 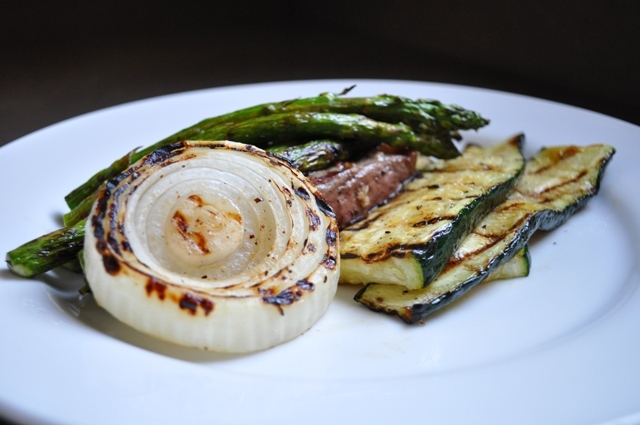 For last night's dinner we had asparagus, zucchini and onion that needed be used up and the grill was the perfect cooking vehicle. A little olive oil, sea salt and pepper and your veggies are ready to go. For a special twist, use a flavored olive oil. I used regular extra virgin olive oil on the onion and asparagus and basil olive oil on the zucchini. The mild flavor of the squash really allows the basil to come through. Delicious! Don't limit yourself to just these veggies. Most anything is fair game...including corn on the cob, bell peppers, yellow squash, whole tomatoes, chiles, portobello mushrooms, green onions and cabbage (this one requires a foil pouch and butter instead of olive oil). Working by veggie type, drizzle with 1 tablespoon of olive oil until glistening and lightly coated. Sprinkle generously with and salt and pepper. I like to use my hands to toss the veggies in the oil salt and pepper to ensure and even distribution of ingredients. Fire up your grill on medium high heat. Different veggies have different cooking times. Start with the thickest veggies first (that will require most cooking time), in this case put the onion on first and cook for 5-7 minutes. Flip the onion using a grill safe (metal) spatula. Then add the zucchini and cook for about 3 minutes and flip and cook for 3 more minutes. 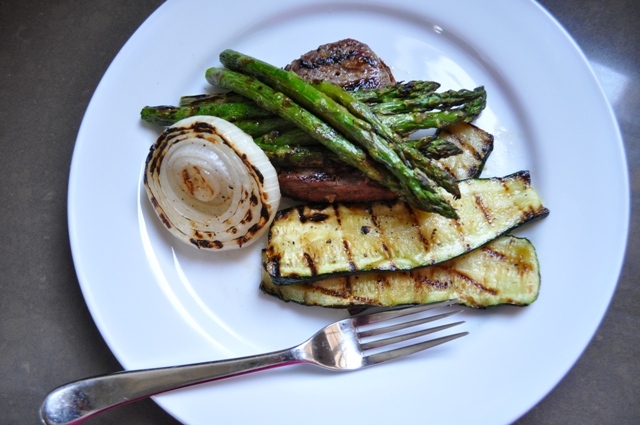 Lastly, lay asparagus on the grill perpendicular to the grates when you have 3 minutes left to cook your veggies. After a minute, begin to roll the asparagus so that it gets evenly cooked on all sides. Serve alongside your favorite grilled chicken, fish or steak. That looks like an excellent summer dinner! I threw some zucchini on the grill for the first time a few nights ago and loved it; I can't wait to try more veggies. OMG, I am so happy the nearest self-serve frozen yogurt shop is prohibitively far enough to not want to go every night. We have been going on weekends and it's so easy to get carried away. So good, though.